Nex FlowTM offers special items to improve industry housekeeping and special applications utilizing air amplification and vacuum technology. The following items utilize compressed air, eliminating the problems of high maintenance and short life span from electrical vacuum and blower systems often used in these applications. Blow dirt, chips and scrap out of deep blind holes in one easy step that really works!! Ideal for cleaning drilled holes and deep cavities. Can clean holes up to 1" (25 mm) in diameter and 20" (525 MM) deep. Unlike make shift vacuum systems that are cumbersome to use and do not work well, The X-STREAM™ Blind Hole Cleaning System actually works and is specifically designed to remove dirt, debris, chips and scrap from drilled holes, deep containers and grooves from 1” diameter to 20” deep. Minimal air consumption of 11 SCFM at 80 PSIG for more shallow holes and only 20 SCFM for very deep holes. Blow guns alone can create a potentially hazardous situation with flying debris. 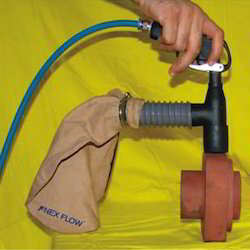 The X-STREAM™ Blind Hole Cleaning System creates the ideal blow-off force once the hole adaptor is flush with the hole directing the unit in such a way to dislodge and direct all the debris into the collection bag. All the dirt is contained within the unit as it is passed into the reusable collection bag, protecting the operator from any contaminants. Looking for Industrial Housekeeping Items ?